Sam and Alice are brother and sister. And like most siblings, they don't always see eye to eye. But in these three stories, that's half the fun! What's in Sam's Sock: Sam and Alice imagine very different possibilities for the lump in Sam's sock. The Jungle: Sam and Alice contend with close calls in the peril-filled jungle, where they are mistaken for a snack more than once. 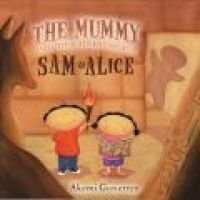 The Mummy: Alice befriends a mummy while Sam wants to know the secrets of ancient Egypt.